Peck and Loren are at their most stylish when their characters team up to halt the assassination of Hassan Jena (Carl Duering), the prime minister of an unidentified country in the Middle East. After spending their first night together and deciphering the hieroglyphic MacGuffin, David Pollock (Peck) and Yasmin Azir (Loren) hop into her red Mercedes-Benz 230SL coupe and race off to stop disaster. 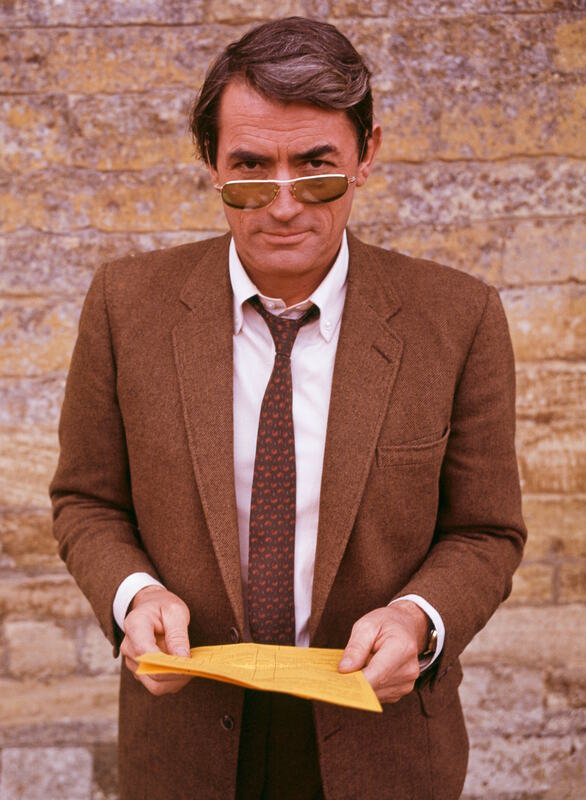 The famously well-tailored Gregory Peck was a client of H. Huntsman & Sons both on and off screen, and the English setting of Arabesque provides the perfect opportunity for the actor to sport the Savile Row tailor’s wares, including this brown flannel suit that Peck wears for this climactic sequence. The single-breasted suit jacket has notch lapels that roll to a two-button front, a welted breast pocket, straight flapped hip pockets, double vents, and three-button cuffs. Though pleated trousers were increasingly less fashionable over the course of the 1960s, Peck’s suit honors English sartorial tradition with its double forward pleats. The trousers also have side pockets, jetted back pockets that each close through a single button, and turn-ups (cuffs) on the bottoms. Gregory Peck makes the case for pleats. Peck wears his character’s usual burgundy belt made from an exotic scaled leather like alligator or crocodile skin. The belt closes with a small gold-toned squared single-prong buckle. The suit may be cut and styled in accordance with English traditions, but David’s choice of shirt is an all-American classic. John E. Brooks was inspired by English polo players who kept their shirt collars in place with buttons, leading to the 1896 introduction of the Brooks Brothers button-down shirt. Despite the shirt’s English origins, the practice of wearing a button-down collared shirt with a suit and tie was far more acceptable in the dressed-down American culture seventy years later when David Pollock donned his ecru cotton button-down collar shirt in a London hotel room. The shirt, made by Frank Foster of London (as confirmed by the shirtmaker’s Instagram page), has a spread button-down collar, breast pocket, and single-button rounded cuffs. The collar may be unbuttoned but, believe me, it has buttons! David’s tie is dark green with a mini red paisley pattern, tied in a small four-in-hand knot. 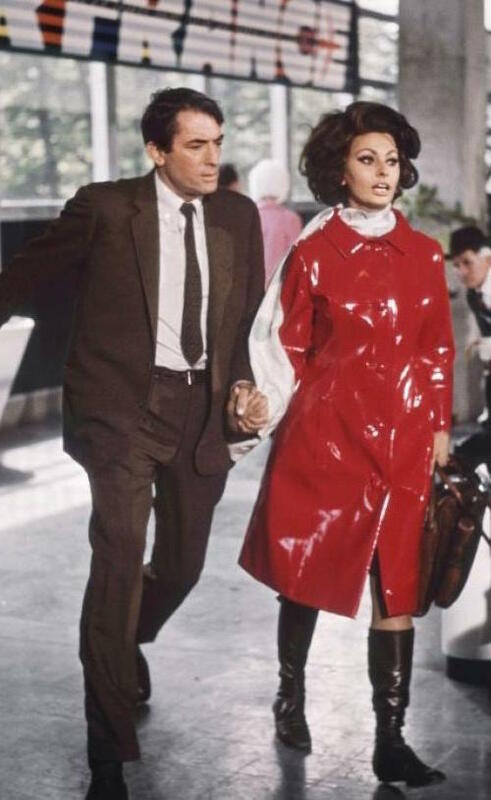 Style icons Sophia Loren and Gregory Peck in Christian Dior and H. Huntsman & Sons, respectively. There is a brief moment when the label of David’s tie can briefly be seen as he and Yasmin frantically try to crash the prime minister’s reception at the airport. Can any vintage menswear experts ID the maker of David’s tie? David’s shoes are burgundy leather apron-toe derbies that coordinate with his belt, worn with charcoal socks. Yasmin and David scramble to get away safely with the prime minister in tow. David wears an elegant gold wristwatch with a silver dial and russet brown leather strap that coordinates with his earthy wardrobe and burgundy leather belt and shoes. Let’s hope that watch is waterproof! While concentrating on some early morning reading (and deciphering) in their room at the Kelly Hotel, David wears a pair of light brown plastic glasses that enhance his professorial reputation. If Peck looks professorial in his eyeglasses, he looks very cool in his gold-framed aviator-style sunglasses that get tragically limited screen time. These amber-tinted shades are best seen when David sits in Yasmin’s Benz, though the inclement weather obviates their need in the first place. This isn’t the sort of weather that calls for sunglasses, but when you’ve got a sharp pair of aviators like David Pollock does, it would be a sin to waste them. Gregory Peck and Sophia Loren both brought their personal style to their roles in Arabesque. While her exquisite costumes were designed by Christian Dior, Peck retained the services of his usual tailor, Huntsman, for a tasteful, timeless, and decidedly English aesthetic that suits his dignified – if unadventurous – character. Our life expectancy may be nil, but I’d like you to know that this has been a real warm human experience.